Ventless Decorative Fireplace Giveaway Contest: What Warms Your Heart? HearthCabinet™ Ventless Decorative Fireplaces is giving away a free decorative ventless fireplace to one lucky person that shares with us a photo of what warms his or her heart. With no chimney, gas, or electricity required, a HearthCabinet™ Ventless Decorative Fireplace is a simple way to add a luxurious fireplace to almost any space. 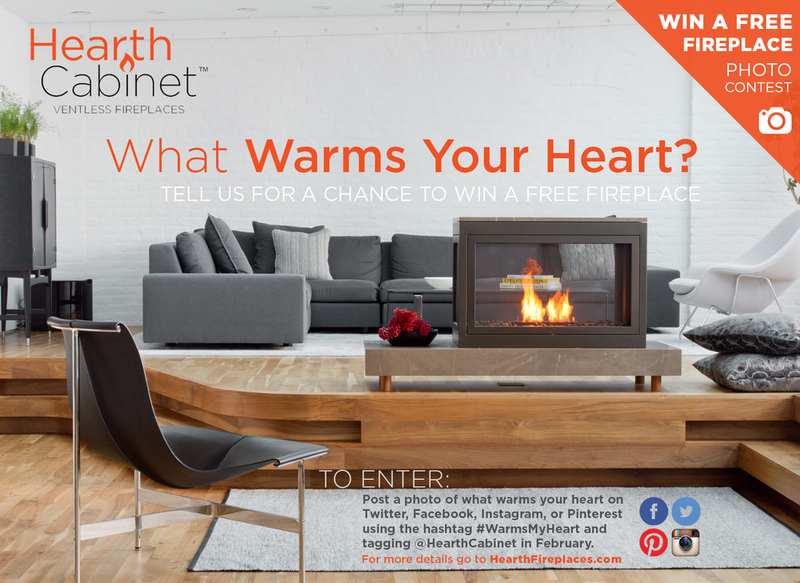 TO ENTER: Post a photo of what warms your heart on Twitter, Facebook, Instagram, or Pinterest using the hashtag #WarmsMyHeart and tagging @HearthCabinet during the month of February. One winner will be chosen at random after the contest closes on February 28th, 2014. The winner will receive one HearthCabinet™ - Small Black Powder Coated Ventless Fireplace (Model #101), including shipping (a $4,700 value). Participants must be over the age of 18, live in United States (Contiguous 48 states), and meet safety and installation requirements. Inappropriate images of any kind will disqualify a participant from winning the contest. We look forward to seeing What Warms Your Heart! Good luck! Published on January 30, 2014 by Hearth Staff.